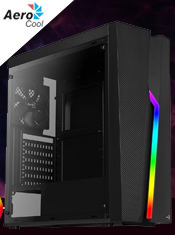 Changing the game for 2018 Game Max have introduced the Precision RGB gaming case is made using metal and tempered glass and is painted black inside and out. 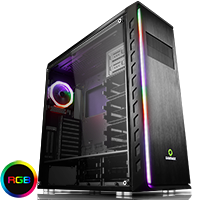 Designed for a high-end builds with an RGB strip running down the top and front of the Precision making it ideal for the gaming enthusiast. 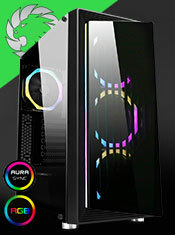 As well as an RGB strip the Precision comes with 4 Dual-Ring Halo Rainbow Fans, 3 x 120mm Dual-Ring Halo Rainbow fans at the front and 1 x 120mm Dual-Ring Halo Rainbow at the back to provide an excellent cooling solution to help keep the computer temperature low. 2 fan controllers are included at the top of the case to control the speed of you fans and 1 LED button to control the mode of your fans, there is a hub included in the case allowing you to connect to 10 devices and change the mode and speed of your LED's. There is HD Audio, 2 x USB 3.0 and 2 x USB 2.0 situated on the top to give the user easy access so they can connect to a wide range of media storage devices. Supports GPUs that are up to 472mm in length and CPU coolers that are up to 186mm in height. In line with the Game Max ethos this case offers style, performance and the ultimate experience. Fans - With 3 x 120mm Dual-Ring Halo Rainbow fans on the front and 1 x 120mm Dual-Ring Halo Rainbow fans on the back are all included to take your chassis to the next level. Tempered Glass - Full tempered glass left side panel included allows the user to show off their internal components. Water-Cooling Support - The front panel supports 360 / 420mm radiators, thickness below 61mm, the top supports radiators 280/360mm thickness below 58mm and the back supports 120/140mm radiators. Hub - A hub is included powered by a 4pin Molex allows you to connect to 10 devices. Once connected you can control your fans mode and speed of your LED's. LED Button - An LED button included on the top gives the user easier access when changing the colour of the fans and even more control. Removable Dust Filters - A dust filter on the bottom and a unique dust filter on the side panel of the Precision helps to prevent dust from getting into your build and helps improve the performance of your chassis. I\O Ports - USB2.0 x 2, USB3.0 x 2 and HD Audio. External Bays: If you are using 3 x 120mm Fans at the front you can only use 1 x 5.25" bay. If you are using 3 x 140mm Fans you can't use the 5.25" bays.